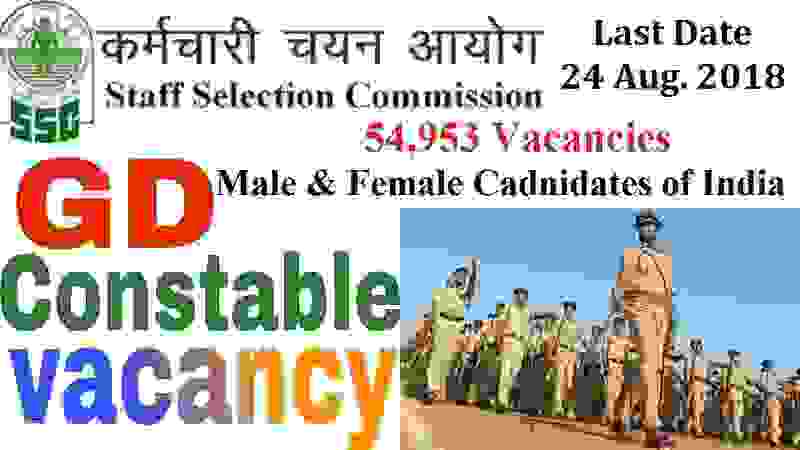 SSC CAPFS Examination 2018 for 54,953 constable posts in various defence forces of India. SSC is going to introduce an official notification on 24th July 2018 related to this recruitment process. SSC conducts this examination every years to recruit candidates as constables in BSF, CISF, CRPF, SSB, ITBP, NIA, AR, SSF defence forces of India. There are total 54,953 vacant posts which are going to filling up through this SSC CAPFs examination 2018. More information about this SSC recruitment process 2018 is given below in this article. Read the whole article carefully before applying online for this SSC CAPFs exam 2018. Pay Band: As per Notification. What are the eligibility Criteria for applying this SSC Recruitment 2018? Education: Those who are wishing to apply for this SSC Recruitment process must passed in his/her 12th class examination in any stream from a well-recognized education board of India. Age Bond: Must have age in between 18 years to 21 years for applying this SSC Recruitment process 2018. What are the various Physical Eligibility Test for this SSC CAPFs Exam? What is the application Fee for applying this SSC CAPFs Exam? You can pay the SSC CAPFs exam Fee through the following ways: “ Debit Card, Credit Card, Net Banking”. What is the Process for applying this SSC Recruitment? The online process for applying these Government jobs for 12th pass candidates will be active on 21st July 2018. So candidates can apply online for this CAPFs examination 2018, there is no other process for applying these Government jobs in India. Check IMPORTANT LINK section for reference links. 24th July 2018 is the starting Date to apply. 24th Aug. 2018 is the Last Date to apply online.